Hello and welcome to the podcast. I’m so glad that you’re here. 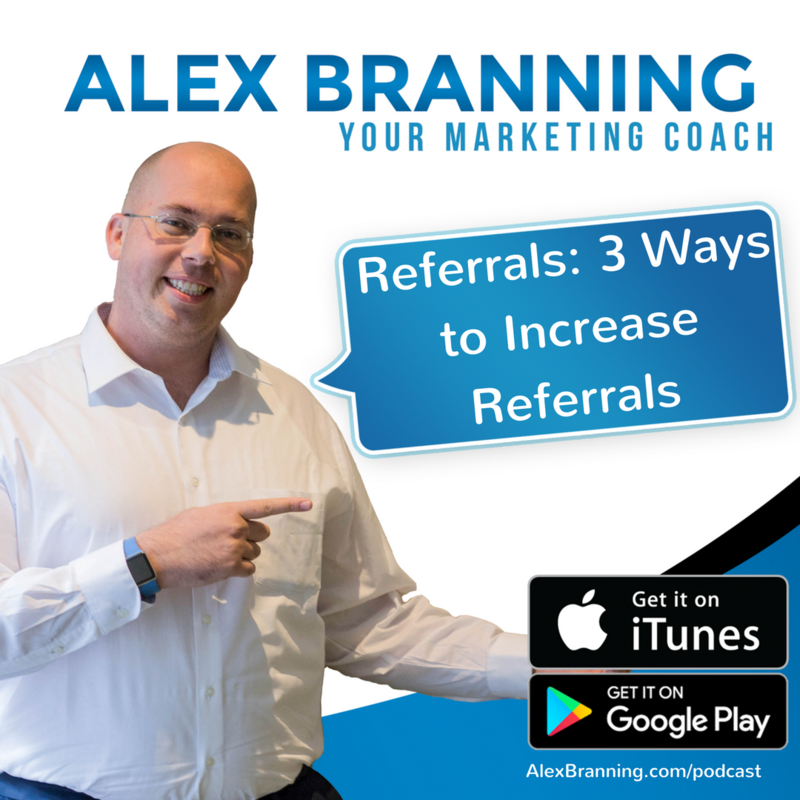 This is episode four of the Alex Branning podcast: Your Marketing Coach. Today I’m going to discuss all about referrals. I love giving and getting referrals. We’re going to dive into what it means to give a really good referral so that we understand what it is when we get one. I’m going to talk about setting up systems within your business so that you have referrals coming in on a consistent and regular basis. And then I’m going to close this out with a really, really good resource that will instruct you and guide you into executing the systems that I’m going to be sharing about. First, I want to introduce a villain. I want to introduce a bad guy, if you will, in the marketing space. You know how those pictures where on your shoulders, on one side there’s the angel and on the other side there’s the demon or the bad guy who tells you to do the wrong thing? I want you to visualize in place of the angel, there’s me, the marketing coach who’s guiding you and wants you to make the right decisions and on the other side, there’s random marketing guy or wing it, if you will. Wing it has shiny object syndrome and doesn’t plan things out and just wants to try things and throw them against the wall to see if they stick. Wing it, or I’m going to call him that, I’m just going to make a fun little cartoon character called Wing It. Wing It wants you just to go with the flow and marketing will just happen and referrals will come in when people remember my name. No, no. That is not good. We need to plan this out. We need to build systems around referrals, create opportunities for the people that love us and love what we do and get good results from our work. We need to put systems in place so that they can refer us easily. Let’s talk about this. Number one, what does it look like to exchange referrals? What does it look like to give a really good referral? If we know what it looks like to give one, then we know what we’re looking for when we get one. I have a book by a gal named Stacey O’Byrne, she’s brilliant, she talks about referrals and she uses this great word picture of a piggy bank. She said, “You have to put money in a piggy bank before you get the money out.” In other words, if you just grab a piggy bank from the store, you go to Target, grab a piggy bank, take it home and then you pop the cork out and shake it expecting money to come out, you’re going to be sorely disappointed. In the same way, if you start asking for referrals but you have not given referrals, you are not a giver, you won’t be getting any good referrals. When I meet a new business ally, I’ll explain what an ally is in just a moment, I look for people that I can refer to him. A good referral that I give is when I introduce my friend or client to this business ally, I always introduce the two of them together in an email or a Facebook message. I tell my client who the person is that I’m referring them to and why I think they are a great match. And then, I tell the person that is getting the referral who the client is that I’m sending their way, why I thought that they would make a good fit for each other and the best way to get in touch with them. It could be just replying to the email or in some cases, I will give out the phone number if I know that I have permission. That’s what a really good referral looks like. I am giving the person who will be responding information on who the person is, what triggered them in my mind and the best way to get a hold of them. And I’m telling the person who would be hiring the business, I’m telling my friend who I am connecting with the other business ally that I have, why I think that they would make a great fit. This is not a random occurrence. In other words, I don’t sit down and think, okay who am I going to refer today to my friend Chris? That’s not usually what happens. It comes about in conversation. It’s one of the things that I keep at the top of my mind. When I’m talking to client I think, okay, who can help this person achieve their goals? I’m usually part of that team which is why they’re talking to me about different marketing plans. But I also am looking at who else can support this person in getting to where they want to go. That is one of the things I want to teach you on this podcast is how to describe yourself in a way that you become top of mind when people meet your ideal client. Let’s talk about the three different referral systems and then I’m going to share how to introduce yourself so that you become top of mind. I have three different buckets that I put my referral partners, my referral systems in. Number one, the ambassadors are the customers that have hired you and work with you that really enjoy you and they want to introduce you to their friends because you’ve done a great job for them and they want to be seen as a hero both to their friends and to you. They want to get in good. They’re givers. An ambassador’s just somebody who’s out looking to give, give, give. You know these people, you like hanging out with these people. The ambassadors that are in your life are not going to be the leeches that come around us. These are people that are always looking to give and help others. In my business, the Branding Group, I have many ambassadors. They could be people that I’ve helped on a coaching call. They could be people that I work with on a regular basis or they could just be somebody that I met at an event that really connected with my message and my personality and they just want to help see me grow. Those are ambassadors. Then we have allies. These are business allies. These are people that you can send referrals back and forth to and they know that you are going to support their client. For me, I’m in the digital marketing space, my company builds websites, apps and we help with Facebook. For me, I’m looking to work with small businesses and solopreneurs. My ideal business allies are people who also help small business owners and solopreneurs but don’t compete with me because I’m not looking to take business away from them. Some examples would be people who are in the printing business, promotional products, insurance agents make a great fit because they help with writing commercial policies. Those types of businesses are great allies for me. Then you have affiliates. Affiliates are people that are looking to bring you business in exchange for something. It could be in exchange for some free services or products. It could be in exchange for money. So, I have an affiliate program where I pay percentage of all the revenue generated by the referral. And those are my affiliates and I love working with affiliates. I have a very strong affiliate army that is regularly bringing me new clients to work with. We have a lot of fun together. Some of my allies are also affiliates. That’s totally fine. For me, when I have an ambassador, somebody who brings me a client, I always send them a gift as a thank you. It’s a part of who I am. I want them to know that I appreciate them. It just makes them feel good about connecting their friend with me. Number one, they know that their friend or referral’s going to be treated well and number two, they have gift card from me so that they can go out to dinner with their spouse or their kids. It’s a fun way for me to show my appreciation. 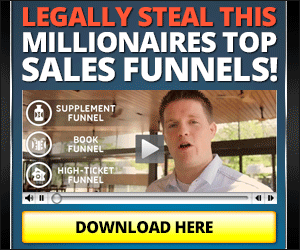 So now that we’ve got those three buckets, I want to talk about some mindset shifts around referrals and I’ve learned so much from my sales coach, Eric Lofholm. I want to make you an offer, if you go to my website, alexbranning.com/episode4, you’ll see a link to download this book “The System” at no cost. I’m going to give you a PDF copy of the book “The System”, Eric’s allowed me to do that. In chapter 12 he talks all about generating unlimited referrals and I’m going to share some of his best ideas from that book. I want to replace those negative referral beliefs with things like this. I really believe in positive affirmations and so positive affirmations around referrals are, people love to give me referrals. That’s a true statement. If you take care of the people that are sent to you, people do love giving you referrals because they like being the hero. They like being the connector. It elevates them in their community. In their circles. It is easy to get referrals. That is true. I am a referral master. Each day I’m getting better and better in the area of referrals. Now, how do you get better getting referrals? You get better at getting referrals when you get better at giving referrals. When people know you are a giver, when people know that referrals come into your business and flow out of your business, they want to be a part of that economy. For me, every single day I have people that are being added to my database, to my connections, that I’m able to come alongside and help. And so I’m meeting people, a lot of people, on a regular basis. The people that are in my world that also serve those clients, want to do business with me and the people that I’m bringing into my community. They know that I am more than happy to give referrals and so what happens? They are happy give me referrals as well. They are happy to give me referrals because they know that I am going to treat their referrals well and they know that those referrals are going to be reciprocated in the future because I am a giver. People give referrals because they want to help you. A lot of times people will give referrals because you ask the right way. I want to talk about that. I learned a great method from a gentleman named Rick Silva. I was at an Eric Lofholm event and Rick Silva got up on stage. He was sharing his methodology for asking for referrals and I’m going to give you a slight paraphrase because he has a very specific way of doing it, I’ve modified it slightly for my own voice. You start not with your name because when people stand up at a referral meeting or they get introduced, the name is one of the things that they look for but I always respond, they say, “Hey who are you?” And I say, “I am a lead generation expert. My name is Alex Branning and my company works with entrepreneurs and small business owners to generate leads on a regular basis at little or no cost.” That is how I introduce myself. That’s my generic introduction. If I’m talking to an insurance agent, for example, and I either know that he’s an insurance agent or it says so on his badge, the way that I introduce myself shifts a little bit and I say, when I introduce I say, “Hey you know I’m a lead generation expert in the insurance space. I help insurance agents like you all across America generate leads online at little or no cost and I would love to work with you and other agents in your office.” Now do you see how that triggered him? He’s going to go what? Lead generation? That’s something that I need. And then, the way that I’m positioning myself says a lot. When I stand up at a networking event or post something online, I always use very specific language and I identify specific target markets that I want to work with so that people will remember me when they’re talking to those individual clients. For example, if I say, “I’m a lead generation expert for small business owners.” That’s very broad. If I say, “I’m a lead generation expert working with insurance agents to generate low or no cost leads.” Now the next time they’re talking to an insurance agent, my name is more likely to come up because people know me and like me in my community and I was very specific in how I can help them. I’m going to be putting together a video resource from Rick so that you can get his full explanation on his 30 second pitch. It is absolutely brilliant. I highly recommend it. I butchered it a little bit on this podcast so I’m going to be delivering that to you. And I butchered it because again, I took what he did and I modified for my voice. So, what I want you to do is not take what I’ve done, I want you to listen to how he does it because he actually owns a referral networking company and so this his specialty. He thrives in the referral space. So, I will be getting that to you. Check out my website. Again, alexbranning.com/episode4 and I’ll have that for you. I want to end with this. I want to end with goal setting. A lot of times we don’t set goals for ourselves. Earlier in this episode I introduced that villain, the random marketing guy. The guy who’s just winging it. The random marketing guy does not know how many referrals he got last month because he’s not keeping track. If you don’t keep track, if you don’t manage it, if you don’t write it down, you will never know how many more referrals you want to get the next month. In other words, if you don’t know how many referrals you got in January, how can you say you want to get more referrals in February if you don’t even know what that number is? How can you measure that? You can’t. You have to know, okay, I want this many referrals and then go for it. For us at the Branning Group, I always set goals for the number of new leads that we’re going to get from Facebook ads. Number of new leads that we’re going to get from referrals. And I even break it down based on the social network so that way I can be very specific as far as what I’m searching for. What I’m going for. If I don’t have a finish line, how could I run the race to completion when I don’t know where that finish line is? If I don’t know where finish line is, how do I know if I should be sprinting or pacing myself? Anyway, make sure that you set goals please. For me, our goal at the Branning Group is 10 referrals a month. Happy to say in December, which I thought was going to be a slow month, we actually got almost 10 referrals, we ended up with nine referrals that month in a two week period, which was just phenomenal. In January, our goal was 10 and we ended up getting, I think we’re going to end up with about 12 when it’s all said and done. Just waiting for the contact info on a couple more. So, we did hit our goal. Without us hitting our goal though, when we have it on our goal board, we say we want this many referrals, it pushes us to ask. If you have it on one of the things that you’re keeping track of, it pushes you to ask for referrals. If you don’t ask for them, people won’t give them. A lot of times. There are people who are just naturally givers, but a lot of times you just have to ask. You have to ask nicely and here’s one of the ways that I recommend doing it. When I’m talking to somebody I’ll say, “Hey, you know, I would love to work,” if I know for example, that they are, if I’m talking to an insurance agent, I’ll say, “You know Chris, I would love to work with three real estate agents that you do business with and I would love to help them create a lead generation system where they benefit and then you can benefit by writing their policies. Can we set up some phone calls with three of your favorite real estate agents so that we can work together to create some lead generation systems?” What that does is that puts the insurance agent in a position where when they introduce to their real estate agents that they love doing business with, they know that their real estate agents are going to get taken care of because I’ve already done the work and shown them that it works. They also know that the systems that I’m going to be setting up will benefit them. It puts them in a really good spot. What does that do? That puts the person on the phone in a position to where they are now thinking, okay, who do I know that doesn’t have a mobile app that I could connect with Alex? It encourages them to actively seek out that referral for me. It puts me in a really good spot, puts them in a good spot and that only works if they know I’m going to take care of the client. If there’s a question about it or this is the first referral that they’ve given me, that’s not a good move because that request has to be made from a position of trust. But that’s another way for me to generate referrals. Last but not least, I talk a lot about how I can help you and come along side you. Right before I recorded this podcast episode I was on the phone with my Level 10 group. Every Friday we do a live ask me anything coaching call. If you go to alexbranning.com/level10 I talk more about it there. On this Level 10 call, we were talking today about ways to increase the value that we offer all of our clients and creating some new revenue streams and I was talking with one of them about email marketing and in our Level 10 calls, we really dive in deep on how to actually execute the strategies that we talk about. Every week we bring up, I release training on Wednesdays in the Level 10 group then we talk about it on Fridays. Ways to implement this. Active community. 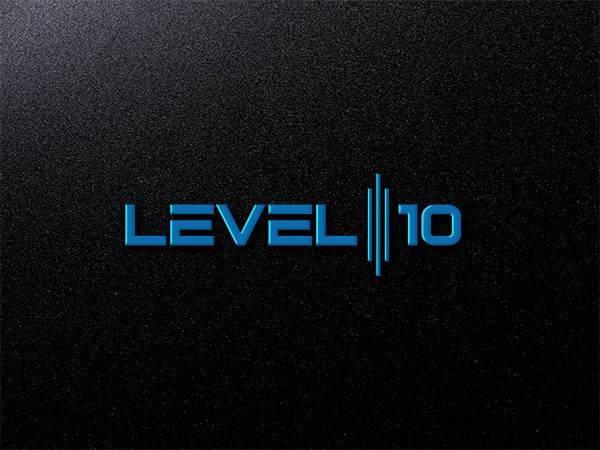 The Level 10 coaching program, it’s only a dollar a day and I highly recommend checking it out. It’s going to be a huge benefit for you. Especially if you’re listening to this podcast going, “Man I really wish that I had an active referral network. I just don’t know how to get started on it.” I’m hosting some pretty high-level training in the Level 10 group and I recommend that you join so that you can follow the system. 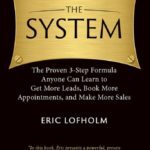 I also recommend that you get that free book that I offered, The System by Eric Lofholm. If you go to alexbranning.com/episode4 you can grab a free copy of it. Eric’s given me permission to give away the free PDF. It’s all yours if you go to the website. Go to the page for this episode. I will also have a free resource from Rick Silva so you can check that out as well. Thank you so much for being a part of this podcast and listening. I’m so excited. Next week is the first week of February and it is Facebook February. Doesn’t quite roll off the tongue, but every single week in February we are talking about Facebook. We’re talking about Facebook groups one week, we’re talking about how to grow your Facebook pages. I’m diving deep into Facebook ads. And then I’m going into some very unique strategies on Facebook that continually work to generate lower no cost leads for your business. I am Alex Branning, your marketing coach. Follow me, don’t follow the random marketing guy. Make sure that you have a plan and you’re not winging it. I appreciate you, your business is going to grow in 2018. You have so much ahead of you. The best days are yet ahead. Please connect with me. Search for Alex Branning. You’ll find me on LinkedIn and Facebook and I look forward to supporting you in the future. Talk soon.